150 x 100 mm. – 692 leaves, with 113 large decorative initials and 14 historiated initials. 150 x 100 mm. 692 leaves. 14 historiated initials. The manuscript was undoubtedly written in Paris. The production of small format bibles flourished in Paris in the 13th century. Written on extremely thin parchment in an extraordinarily tiny script, these codices were highly portable. This small-scale Bible is a typical example of 13th-century French manuscript production in Paris. Eschewing luxury, these manuscripts possessed an advantage that had simply not existed hitherto: they contained all the books of the Bible in a single volume. Due to the small scale of these manuscripts and the correspondingly short height of the lines, the illuminations in these pocket Bibles had to be very small. Together with the prologue of St. Jerome (fol. 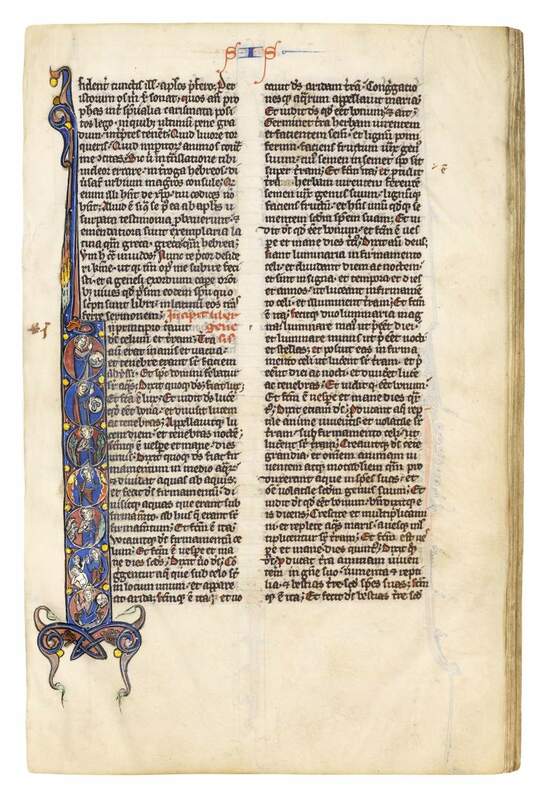 1), the first book of each group of biblical texts is highlighted with a historiated initial. This manuscript was made for a Dominican priest from an academic milieu. Wealthy Flemish Dominicans studied at the Parisian college of Saint-Jacques. This work is now in the collection of the Museum Schnütgen in Cologne.